Unsocialized: 16 Days of Activism! EqualityNow Sapphire speaks at Four Bridges looked on by a flying Linden. Today, feminists were griefed as they met to hear the organisation Equality Now, who spoke about their campaigns on prostitution, trafficking and challenging video games depicting sexual violence in Japan. Reaction from people who are feeling uncomfortable about the 16 Days of Action is becoming more extreme, from disgusting comments on various forums, through to griefing attacks - and personal attacks by im on key organisers. Lindens turned up to the Equality Now meeting. Noone was able to say whether this was because of the griefer, or because of the mass questioning this programme is highlighting, ie. Second Life's allowing violent sexist behaviour on their platform. 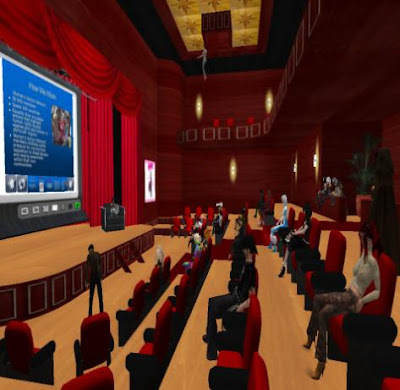 The programme was devised by Ledoof Constantineau of SLLU Feminist Network and women from across the political, cultural and social spectrum of the world both real and virtual. These incidents, I believe, prove this fantastic campaign is making a huge impact. As speaker EqualityNow Sapphire replied to a comment on censorship, "... the censorship argument is often used- yet they think nothing of trying to stop us from expressing ourselves- strange!" The fight for real equality goes on!